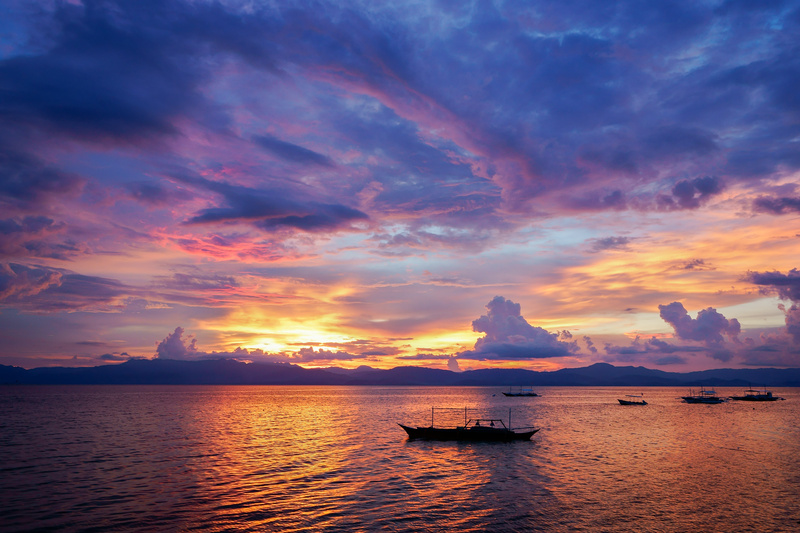 The Philippines are made up of over 7000 islands, which have a combined coastline of over 22,548 miles. The Philippines are part of the ‘Coral Triangle,’ which has more marine species in it than anywhere else in the world, with over 2200 species of fish living in this area alone. You can pretty much dive the Philippines all year round as water temperature stays between 27C to 31C. If you are looking to experience the hottest months of the Philippines, the best time to go would be April to June, when the water temperature can reach up to 31C. Remember that Christmas, Chinese New Year and Easter are usually the busiest times around the Philippines so if you’re looking for some relaxation mixed with some peace and quiet as well as diving, then it’s best to avoid these times of the year. If diving is the reason for your travel plans to the Philippines, the best time to go would be December to April. 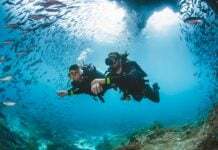 Around this time the wind begins to change direction, ready for monsoon season, however with this change, brings even more dive sites to experience, that wouldn’t otherwise be open during the drier months. Some of the best dive sites found throughout the Philippines include Malapascua, where you will find thresher sharks. Panagatan, where you will find large Pelagics, Tubbataha, which is a well known World Heritage site and of course, the wrecks located at Coron and Subic Bay. At this point in time, it is not safe to travel to the south of the Philippines however, staying north will fulfill all of your diving needs. Make sure before jetting off that you have fully comprehensive dive and travel insurance. 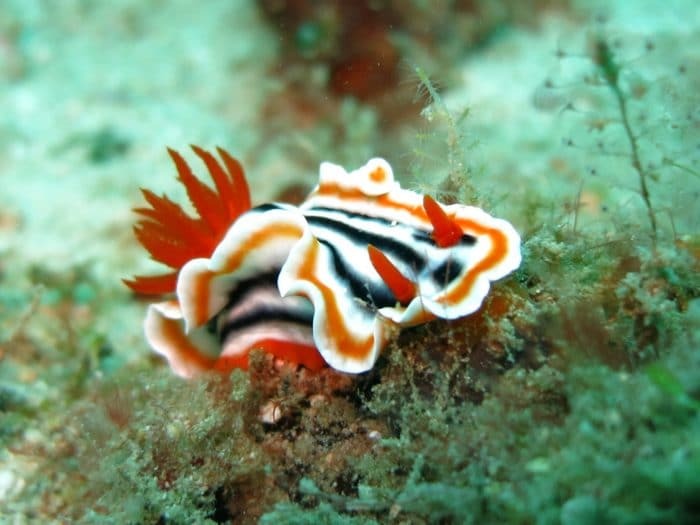 ‘Twin Rocks’ is where you’ll find beautifully colored Nudibranchs. 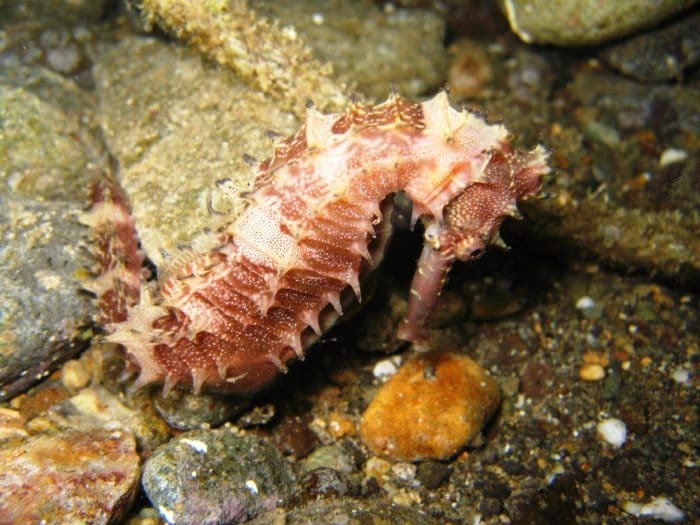 The majority of Manila-based divers find themselves traveling to Anilao. Located just 3 hours drive from Manila, on the island of Luzon; it’s easy to get to and is a macro heaven for underwater photographers. Surrounded by healthy reefs and more Indo-Pacific critters than you can feast your eyes on, this diving location should not be missed off any divers list. What attracts divers to Anilao is the bio-diversity of the rich reefs mixed with the sheer variety of marine life living in these waters. This island has a number of amazing beachfront resorts that back onto a jungle, which in itself is an incredible sight to see. ‘Kirby’s Rock’ is where you can find crabs hiding behind the rocks. Twin Rocks – This dive site is where you’ll see incredible marine life from as shallow as 3m below the surface. It’s a great location for macro as well as wide-angle photography and is home to soft and hard corals, reef fish, schooling Jacks, Nudibranchs and more. Kirby’s Rock – This top dive site has excellent visibility and is home to a stunning wall where you’ll find critters and all sorts of marine life, make sure to keep an eye out for the crabs hiding behind the rocks. Beatrice – Beatrice dive site is more of an advanced dive site due to its strong currents. However, with its strong current comes incredible marine life as well as huge schools of Anthias that created beautiful balls of color. Secret Bay – This is a popular muck dive where, if you’re lucky you might find mimic Octopi as well as Frogfish, Pipefish, and tiny Seahorses. If you’re a budding underwater photographer, then this spot should not be missed. You’ll find many critters hiding in the beautiful anemones that cover the Taiei Maru Wreck. This wreck dive is one of the most incredible dive sites found throughout the Philippines. This wreck is a 10,000-ton fleet oiler, which is found approximately 25m below the surface. Visibility is around 15m however, once reaching the wreck you’ll see the whole surface area is totally covered in life. Due to the size of the wreck, you’ll have to move pretty quickly if you’re going to see it in its entirety. Some divers choose to take this dive in two parts in order to really see it in all its glory. It’s possible to swim through the length of the wreck, gliding through its open holds. 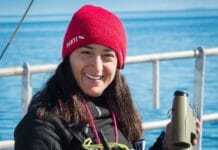 The deck is an incredible sight to see, with huge schools of Damselfish and Fusiliers. It’s also a great place to see large grouper and other larger fish that have made this wreck their home. If you’re traveling to the Philippines, do not miss out on this incredible wreck dive. 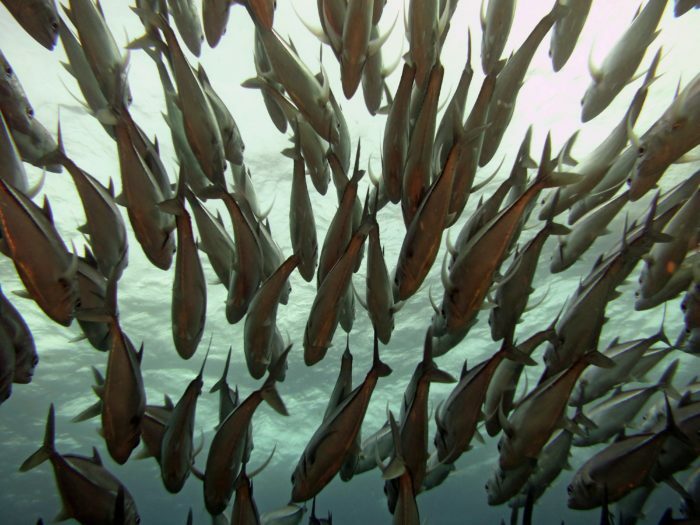 Huge schools of Jackfish pass by Coconut dive site. Apo Island, located close to Dumaguete is home to some incredible dive sites, however, Coconut has been considered as one of the best in the area. It has the best visibility in this location and attracts some big fish. However, the best attractions in this area are the huge schools of Jack, which are brought through on the current. 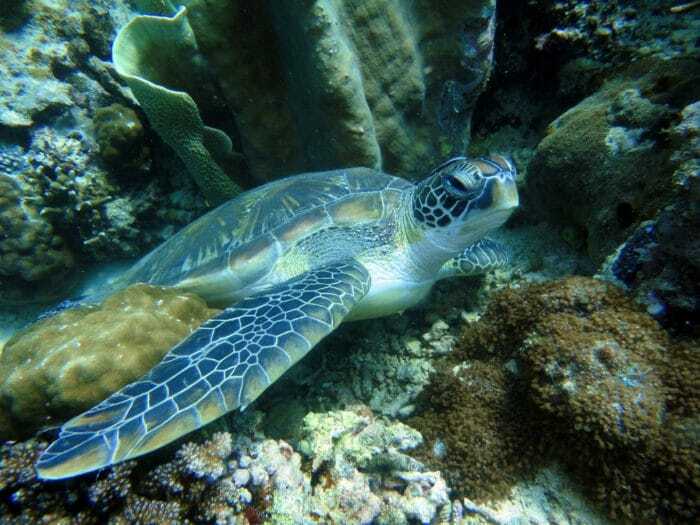 You also might see sea snakes, turtles and many kinds of reef fish.  Due to the current and depth of this site, it’s usually limited to advanced divers. Discovery Palawan is the only liveaboard featuring trips to Apo Island. 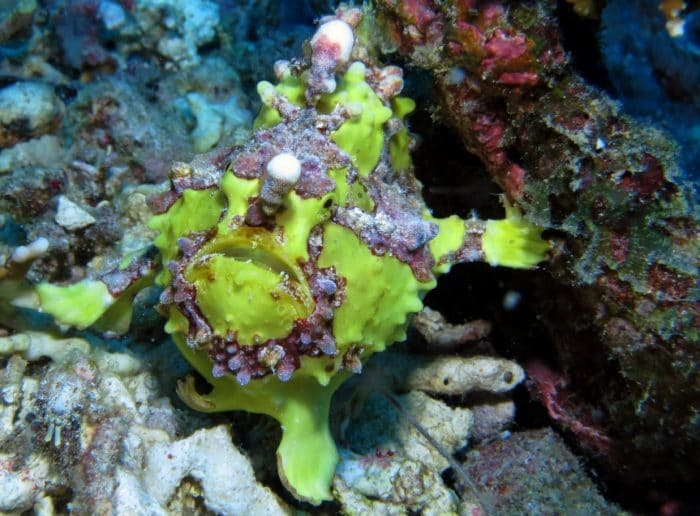 Yapak 2 is home to some amazingly colored Frogfish. Yapak 2 is found on the north side of Boracay and is home to large pelagics. The descent into the blue abyss is a great way to start the dive and once you see the wall, your excitement will start building. At around 32m you’ll swim along the wall and get to see Sharks, Rays, and Tuna all gliding against the current. Make sure you look at the wall, as you’ll see the smaller marine life that lives in the cracks and crevices, including beautiful Nudibranchs, really tiny Pygmy Seahorses and Frogfish. Apo Reef is a great place to see Turtles relaxing. 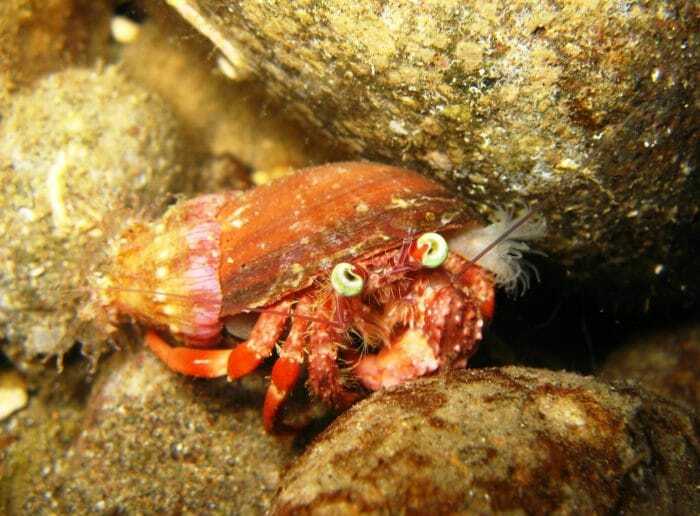 This dive site is a marine sanctuary that is located west of Occidental Mindoro. 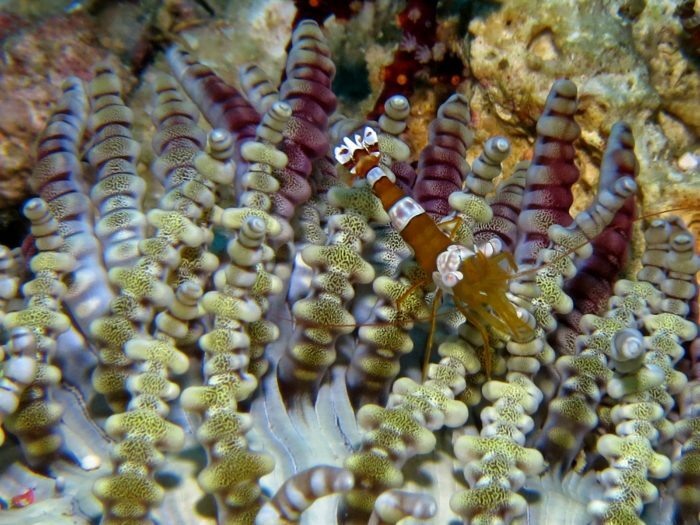 If you’re looking for biodiversity at its best, then Apo Reef is the place to go. This reef stretches for 21 miles and has a narrow channel running from east to west, which divides the reef into two parts, north and south. 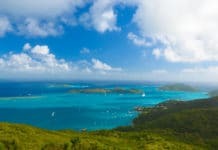 This is the ideal place to see large pelagic fish, which include Sharks, Barracuda and even Manta Rays. You may also get the chance to see Turtles and Seahorses. If you look closely at the reef you may be able to spot a Seahorse. There are so many incredible dive sites around the Philippines, so if you have one that hasn’t been mentioned on this list, tell us about it in the comments below. Thanks so much for these great recommendations. I’m struggling to pin down where these reefs are? Which islands? My husband and I are planning a free diving trip to Philippines and we would like to maximise the time in the water. We arrive at the end of April and leave within 11 days. We really into big and small fish so trying to plan where to go seems a little overwhelming.